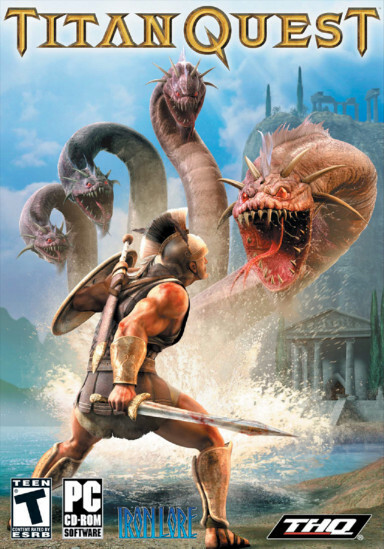 GB: First of all, how is the development of Titan Quest coming along? Are you still on track for a June release? Michael: Everything is in the game, and we're hammering on the last bugs, getting the final polish on the game, and refining the balancing. We are definitely on track for a June release, as we're already having a hard time around the office keeping people from getting sucked in and playing all day. GB: How is the game's storyline structured? Will we be progressing through chapters or acts, or can we return to earlier areas of the game at any time to take advantage of side quests, etc. that we may have missed? Michael: Really, it's some of both. We have three main regions that the game takes you to (Greece, Egypt, and Asia), and each one is sort of like a chapter in the larger story. When you start the game, you're really focused on how the events in the world are having an impact on the local scene, and as you follow the story, you gradually discover how these local events are part of a much larger development, so that as you move from region to region, the story unfolds and reveals itself, taking some twists and turns along the way. Once you've moved forward, though, you can go back at any time to earlier areas and pick up side quests, explore around a bit to found out more about what people are saying about what's going on, or talk to storytellers who will give you insight into some of the myths and history of the region. There are certain main story beats that you will definitely uncover in the main quest path, but a lot of the subtle details are woven through the NPC's and side quests, so that players can engage with the story elements to a greater or lesser extent depending on individual preferences. GB: Can you give us a quick description for each of the game's eight skill masteries? How does the game's class system make use of these to allow for unique and diverse character builds? Michael: Let me take a deep breath, because this might take a while. So, each of the eight masteries has a theme to it as well as a set of gameplay dynamics. Warfare deals with offensive melee attacks, including skills that allow you to build up your damage-dealing ability, like dual-wielding or going into a battle rage; Defense is centered around armor and shield skills, both skills that increase your ability to avoid damage or recover from hits and skills that allow you to counter with shield-based attacks; Earth is more magically focused, with a variety of direct attacks as well as some enchantments and a nice tank pet you can use to keep enemies busy while you nuke them; Storm is a somewhat different take on the elements, as it focuses on cold and lightning skills and has a bit deeper defensive and crowd-control element in that you can slow down enemies, inflict reprisal damage on them, or lay down some area-effect damage that also disrupts missile attacks; Hunting gives you skills that are related to bow and spear combat and also gives you some snares, as you might expect, and advantages when fighting beasts or beastman hybrids; Nature gives you a variety of pets as well as the ability to heal and grow defensive barriers and boost your character's (or your party's) recovery rates; Rogue mostly deals with poisons and dirty tricks, with a lot of active skills that make it a more tactical approach to melee combat; Spirit is all about manipulating life force, so there are a lot of skills related to stealing life, converting life into energy, and weakening your opponents. Now, as you play the game, you get to choose any two of the eight masteries you want for your character, so the combinations can create a vast variety of different behaviors. For example, if you combine Warfare and Defense, you've got a classic fighter-tank, with a lot of passive skills that will pump your offense and defense and a few key active skills for troublesome situations, like when you get surrounded by a gang of monsters. On the other hand, you could take Rogue and Nature, which gives you a similar balance of offensive and defensive abilities, but a lot more active skills and tactical options. So, depending on how you like to play, there are different masteries that will feed into your style. But, that's just the tip of the iceberg. If you combine Warfare with Earth, for example, you can make a damage-dealing machine who can not only rip up the monsters with swords but also with spells. Or, if you combine Nature with Spirit, you can have your own personal army of pets, and you can heal and buff them or sap and weaken your enemies, as needed. There are twenty-eight different combinations of two masteries, and each one has unique dynamics to the interactions of the skills within them, so players have this huge playing field of potential character development that they can explore. Now, consider that when you go into multiplayer, you can have up to five other players who each have their own unique combinations of masteries and skills, and you can really go to town with all of the synergies. When you get a group of characters fighting through the world as a team, there's just an incredible amount of action, with effects and monsters all over the screen, and the tactics available in terms of how you can set-up, manage, and finish encounters is truly phenomenal. The character development aspect of an RPG game is really one of the central, most compelling features, and I think people will have a blast discovering all of the interesting choices they can make with the way we've done this. GB: Tell us a bit about how inventory management will work in Titan Quest, such as the multiplayer trading system, buying and selling from a vendor, and how encumbrance will factor into the game. Also, will there be any sort of "stash" for players to horde their favorite equipment? Michael: Well, first off, there is no encumbrance. It's a great stat for simulation purposes, but we were really focused on making a great, action-packed game and not a simulation. Inventory management will look very familiar to anyone who has played RPG's before. There's a limited amount of space that defines how much your character can carry, and items of varying sizes take up different amounts of that space. Rather than going for a static "stash" that you would have to go back to town to access, we've put in additional "bags" of storage space that are tabbed on the character inventory. So, you can keep all of your potions on one tab, for example, or all of your Relics, and if you're carrying around some set items you've collected and you want to check the requirements, you can just tab over and look at them right away. You earn additional "bags" as you progress through the game, so as you find more stuff you just can't bear to part with, you will have plenty of space to store it in. We have a secure trading screen for multiplayer, so you don't have to dump your stuff on the ground, and buying and selling at the merchants is as simple as left-clicking to buy and right-clicking to sell. One small feature that we slipped in is that you can sell back items you buy (or vice-versa) without the price changing, as long as you are in the merchant interface, so no more losing that great item you didn't mean to sell or losing money over items you didn't mean to buy. Our focus has been on making everything as intuitive and easy to use as possible, so there are just tons of these little polish features in the game. GB: How much of a factor will equipment have in the game? Will equipment effects and bonuses use a random prefix/suffix system, or can we expect to see mostly unique hand-crafted items? Michael: Equipment is a major aspect of the game; for an RPG, it's right up there with character development, story, and combat as one of the core mechanics, and we've devoted a lot of time to it. We're using both a randomized affix system that will mix and match characteristics with base equipment and a large inventory of unique hand-crafted items. I believe there are over a thousand equipment models and something like eight hundred of those are unique for items with hand-tuned names and stats. We have equipment that is tailored to each of the regions, as well as equipment that is themed for different monsters, and equipment that is themed for different character archetypes, so there's a tremendous range of visual style, as well as the range of stats and abilities that the equipment has. Similarly to the character development system, players will be able to explore the equipment in the world for scores of hours and will probably never exhaust the variety that we've built into the game.